Dr Matt Petoe is a biomedical engineer with a keen interest in human perception, neuroscience and clinical research. His PhD research investigated methods of improving the auditory brainstem response test – a diagnostic test used for neonatal hearing screening and assessing neuropathic hearing loss. This work improved the speed and robustness of the test, and received recognition in awarded patents and the formation of a hearing-screening technology company. Following his PhD, Dr Petoe took up a Stroke Foundation Research Fellowship (Auckland City Hospital, New Zealand) and oversaw the recruitment and assessment of stroke patients receiving a novel therapy for upper limb impairment. This successful clinical trial demonstrated that ‘priming’ the brain before physiotherapy sessions promotes faster recovery of upper limb function following stroke. Dr Petoe is currently working at the Bionics Institute, where he joined the Bionic Vision program in 2012 during a clinical trial of a novel bionic eye device. 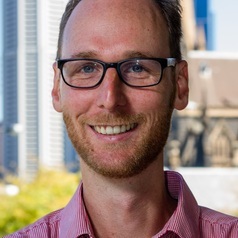 He is a chief investigator on a recently awarded NHMRC project grant (2016 - 2018) to trial the safety and efficacy of the next generation, wide-view bionic eye.